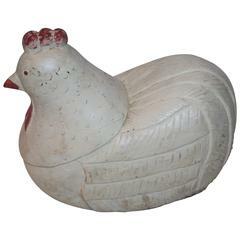 This is a very cool hand carved rooster. There is an unknown signature at the base of the statue. 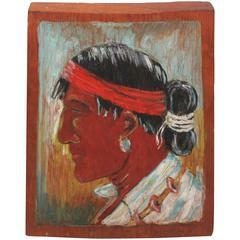 This fine example of early 20th century Folk Art is all original paint and carved from one piece of wood. The weight is heavy and would make a great doorstop in the kitchen. This signed in the lower left hand corner and dated on the reverse 1935 folk art carved wood Indian is in wonderful condition with a nice mellow patina and really good carving. This fantastic pigion is all hand-carved and is in a Shaker style format. 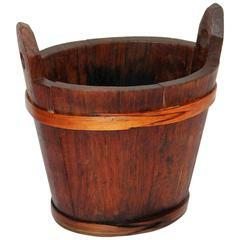 The double handed bucket has hand-carved handles and handmade wraps. The condition is very tight and sturdy. 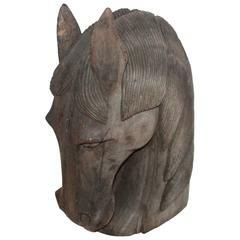 This fantastic hand-carved horse head statue is very well carved and in good condition. A couple age cracks consistent with age and use. Brutalist style chicken in brass and tin by Sergio Bustamante. Solid hardwood carved antique sculptures of a French man and woman can be used as bookends or on their own. This African walking stick is hand carved. 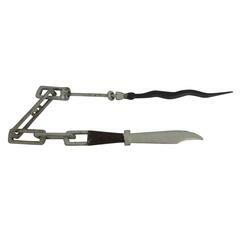 It has a big looped handle with native decorative features throughout. Beautifully finished.